Alex House is a charming homestay run by seasoned travellers, who have been in the hospitality business for a while now in Ladakh and now Goa. 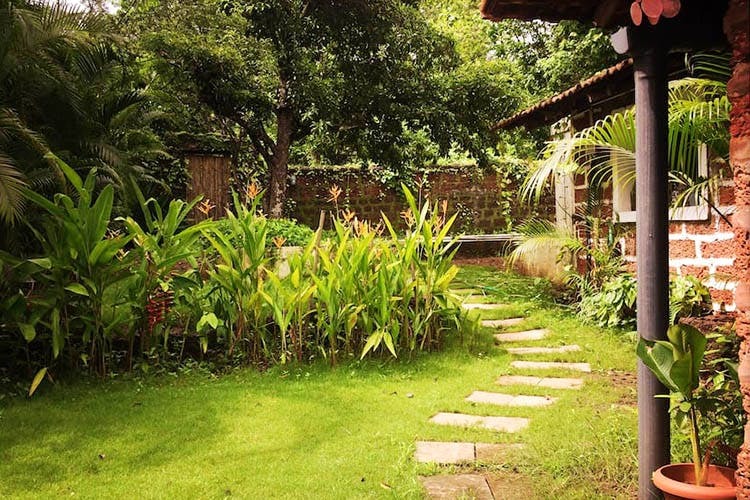 This old charming Goan home is nestled in the hidden secret village of Siolim. Your own private villa-like space with a room, a sitting room and a gigantic bathroom with your own private entrance is what this homestay is about. Not to mention the bathtub or the cute verandah at the entrance to sit by and watch the village life. Seen from the outside, one may feel disappointed at the lack of a huge garden in the front, but don’t let that fool you. Go around the side of the house to find this cute little bamboo gate that opens up in to this secret garden where one can imagine unicorns dancing away. This is where you can eat those lovely homemade breakfasts, or take a dip in their wonderful pool. It seems their pet dog Alex is a great escape artist, who ensured that all the neighbours met him before they met his owners, hence the name Alex House. Being avid art collectors, their house is filled with paintings by some well-known names like Cedric Sartore, Srinidhi Seshadri, Bindu Popli, Prashast Kachru as well pictures shot by the host himself. Aditya & Gayatri, your charming hosts, are curious by nature, so they look forward to meeting new people. Either discussing crazy ideas or marvelling at the amazing things being done around the world, they make for interesting and fun hosts. So if you want company then you have the best in Aditya and Gayatri. So on your next Goa trip, you can have an artistic stay, get inspired to maybe paint yourself or just imagine yourself as the next famous singer or songwriter. You can book Alexhouse here.